Rescuers continued to search through damaged buildings for possible survivors after the violent quake that also injured hundreds, although officials said the death toll was unlikely to rise significantly. 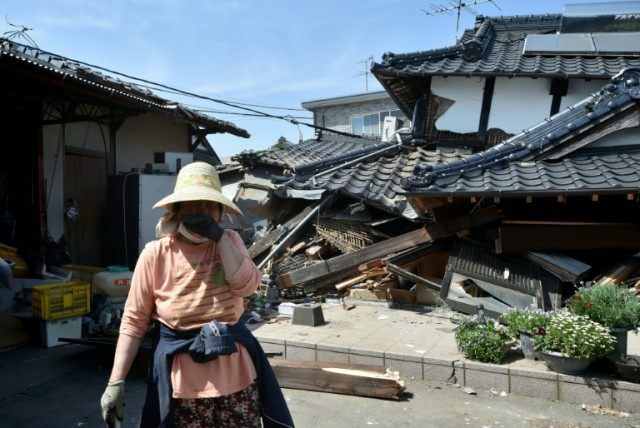 Tens of thousands of people fled their homes after the 6.5-magnitude quake struck the southwestern island of Kyushu on Thursday night, leaving lumps of concrete strewn in the streets. “We tried our best to take all our belongings and go to a shelter by car,” said Haruki Ito, 62, whose house tilted 45 degrees after the quake. Dozens of aftershocks followed the quake, which hit about 9:26 pm (1226 GMT) on Thursday evening, and officials warned the death toll could still rise as rescuers scoured the collapsed structures. As rescue workers toiled through the night hours after the quake struck, an eight-month-old baby girl was pulled from the rubble alive and unharmed. A rescue team with several search dogs patrolled around half-collapsed houses in the town but no new deaths had been announced for more than 14 hours. Scores of people spent the night huddled in front of Mashiki’s town hall, some in tears, while others wrapped themselves in blankets to ward off the night chill. But those still without lined up to get water in plastic bottles or tanks as night began to fall Friday. Train services on Kyushu were temporarily halted and a bullet train derailed — luckily while empty — said Yusuke Nanri, a spokesman for operator JR Kyushu. Bullet train services remained suspended, JR said on its website.